UPDATE: According to his spokesman, Gutierrez was not protesting the "USA" chant, but left early to make it on time to an interview. 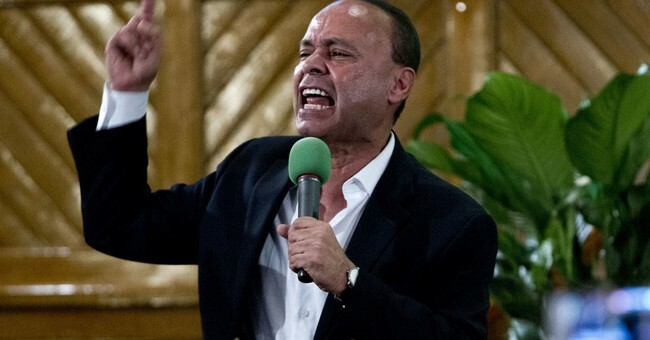 House Minority Leader Nancy Pelosi urged her Democratic colleagues to stay in the chamber Tuesday night during President Trump’s first State of the Union address, or don’t come at all, but one part of the president’s speech was just too much for Democratic Rep. Luis Gutierrez to bear. The Illinois Democrat, who announced in November that he will be retiring after this term, stormed out when chants of “USA!” erupted among lawmakers after Trump’s discussed the Capitol being a monument to the American people. "Even though I disagreed with almost everything he said, for Trump, the speech was clear and well-delivered. Whoever translated it for him from Russian did a good job," he said. "I am still hopeful, but I don’t see this Congress and this President coming to an agreement that prevents the deportation of the Dreamers. "The White House agenda is to gut legal immigration in exchange for allowing some of the Dreamers to live here. For those of us who support legal immigration, and that’s most Democrats and many Republicans, it won’t fly. "And the Dreamers themselves have said they do not want legal status if it comes at the expense of others who will suffer more as part of the bargain. The speech did nothing to bring the pro- and anti-immigrant sides closer together. "I was hoping for some sort of apology on Puerto Rico, but I heard nothing. "Puerto Rico is a metaphor for how this President sees all Latinos and people of color: he does not see us as his equals and he does not see us as fellow human beings. "If you look at how the President has treated Puerto Rico, you have to conclude that he just doesn’t care and probably thinks of Puerto Rico as just another s***hole country. "I was born in 1953 in the U.S. when separate but equal was the law of the land. I am proud of the progress the United States has made as a nation on issues of race, gender, sexual orientation, disabilities, and many other areas where we have advanced. "I was hoping to get through my life without having to witness an outwardly, explicitly racist American President, but my luck ran out."